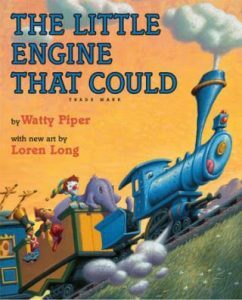 I’m reading stories to my son: The Little Engine That Could by Watty Piper, a beautiful story that I grew up with, and it’s lovely to read the same story to him that my mother read to me; The Three Little Owls by Quentin Blake and Emanuele (Lele) Luzzati (an Italian artist who had a wonderful relationship with Glyndebourne, where I live); many Thomas the Tank Engine books; The Tale of Jeremy Fisher by Beatrix Potter and, of course, The Gruffalo! Any other reading is for research. I wish I needed less sleep so that I could get hooked on some box set. The last show I watched on Netflix was while I was on tour in Asia: Friends from College, a comedy that tapped into a deep nostalgia of the Nineties. It was savagely reviewed — I can understand why — but it didn’t stop me from watching these very damaged/human characters sabotaging themselves and each other. Before that it was season one of The Crown. I have resisted season two for fear I will never get any work done! The Great Gatsby — hopeless love, idealism and the fading American Dream. I was intoxicated by this melancholy air that I breathed with those pages open before me. Finnegans Wake by James Joyce. I was determined to read it because I was singing Samuel Barber’s settings of Joyce texts. The song Nuvoletta was one in particular I was keen to explore and I persevered through some very difficult language. I have always felt the book defeated me. It’s less a poem and more a proverb: “The race is not won by those who are stronger or faster, but by those who think they can.” There’s also The Road Not Taken by Robert Frost (and I disagree with some people’s fad argument that the poem has been misinterpreted over the ages). Also the story of the tortoise and the hare. But these didn’t save me — they were told to me by my mother and they spurred me on. Pride and Prejudice by Jane Austen. I feel as if I have after seeing it depicted so many times in film. I also really want to have read Gabriel Garcia Marquez’s Love in the Time of Cholera before I die. I’m a romance junkie. My favourite period film is Sense and sensibility (Ang Lee is a genius). My favourite foreign rom-coms are L’Arnacœur (Heartbreaker) and Jeux d’enfants (Love Me If You Dare) by Yann Samuell. And then there’s My Big Fat Greek Wedding, Serendipity, When Harry Met Sally, and Something New. I loved Jez Butterworth’s The Ferryman and I also loved seeing David Hare’s Skylight. Both kept me captivated — the brilliant writing continually had me changing perspectives and finding new ways to empathise with the characters. How I Met Your Mother. It’s a thoughtful complicated comedy that requires full investment, otherwise there’s just no point: a show for die-hards and nothing less. Music is my life blood, so trying to pick one piece is like trying to pick my favourite blood vessel. La Bohème, which I performed this year at the Royal Opera House. The slow movement of Robert Schumann’s Piano Concerto in A minor — a depiction of his wife, Clara — is so moving to me. England losing the World Cup semi-final to Croatia. The last song that made me cry was Three Lions, in a pub I was in Devon after England won against Sweden in the quarter-finals. To scream with joy and then hear this song played to the smiling, dancing faces of so many hopeful people made me well up and sing along. David Attenborough’s programmes make me cry because of how much he has done to bring nature’s gifts to so many. Reading mindless gossip stories to get out of my head and eventually tire to the point of sleep. Guitar. I can play, but not to the level I would like. I would love to call upon my fingers at a guitar the way I can call upon my voice. 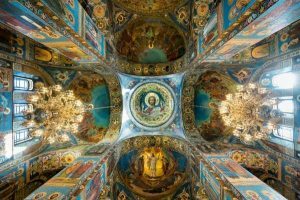 I would own the interior of the Church of the Saviour on Spilled Blood in St Petersburg, Russia, with unbelievable mosaics. With my family and on the stage. I’m having a fantasy dinner party. I’ll invite these artists and authors . 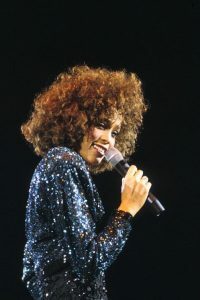 . .
I’d have Roger Federer, an incredible artist on the court whom I have had the privilege of watching up close several times; Mozart — what divinity to have created as he did; Whitney Houston, who was my idol as a child; Jesus — what a story he’d have to tell; and Cleopatra — my most iconic role and I would love to meet her in person.
. . . and I’ll put on this music . . . Anything with Chet Baker. What a voice, what a musician — his mellow yet luscious [trumpet] timbre combined with his mellow yet luscious voice. His music would relax everyone and open everyone up for good conversation. I wasted an evening watching . . .
A film in Paris with a friend where we laughed at the level of confusion we were experiencing. I said: “This is almost as crazy as a David Lynch film.” When the credits rolled, it turned out it was David Lynch. At which point, the film made total sense. Have you ever walked out of a play at the interval? I would never walk out and leave fellow performers with that hole in their gut. Previous LinkThe heART of an Opera SopranoNext LinkDanielle de Niese joins starry lineup of legends as she does the iconic BBC series Desert Island Discs!